A seaside resort is preparing to do battle to save one of its best-known landmark features. Lighthouse authority Trinity House said it has been told by shipping companies they no longer need or use the lights at Southwold or Lowestoft. The two are among 11 of the 71 in the country earmarked for switch-off. Southwold's mayor, Ann Betts, said the "dismayed and disappointed" people in the popular resort may decide to fight any decision to close it. "I thinks it's a great shame," she said. "I grew up with the light flashing in my bedroom for many years, and it's comforting to walk through the streets, especially in the winter months, to see the light flashing. "I am sure the people in shipping do use the lighthouse." Trinity House says most commercial shipping companies these days use global satellite navigation systems to make their way round Britain's coasts. A spokesman said over the past few months local mariners had been consulted and none had raised any objection to doing away with the Southwold and Lowestoft lights. If the final decision is to close, it will not be for another five years until a radio navigation system is introduced that all mariners can easily access. 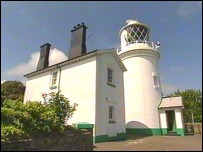 If that happens the lighthouse buildings in Lowestoft and Southwold will remain untouched - both are Grade II listed.